Survive? What is this, Bear Grylls and The Chamber Of Secrets? Let’s be real - there’s nothing to ‘survive’ on a flight, long haul or otherwise. You’re being fed, watered, and oxygenated; all you have to do is sit down, shut up, and not be a cheese-eating racist. Clickbait articles titled otherwise would have a generation of advice-seeking fliers believe that a long haul flight is an epic journey to Mount Doom when really it’s the biggest first world problem of all: Oh, you’re enduring the indignity of travelling thousands of miles over a relatively short space of time and degree of comfort to an exotic destination? Awww, poor thing, does somebody need a waaaah-mbulance? Let’s all not lose our heads but rather count our blessings. Not even regard a long haul flight as a means to be justified by the end, but the reasons why the experience is something to be welcomed as a privilege. 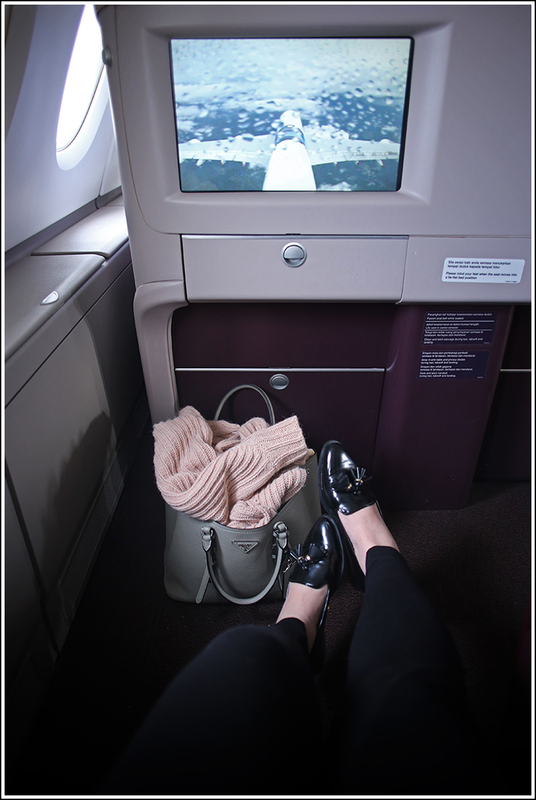 These are the three things I love about flying long haul (not included - squealing WHEEEE! during turbulence). It’s not just about the destination and/or the journey. For me, the very notion of faraway lands and the promise of adventure is every bit as, if not more, exciting than the trip itself. Nothing is more tantalising than anticipation, and nothing extends those pre-holiday thrills than the amount of preparation and waiting that precedes a long flight. Certainly much more so than a ‘touch & go’ 45 minute flight where you finally manage to get comfortable only to be told to buckle up for landing. A huge part of my pre-flight ritual is preparing myself for the ‘maxing, relaxing, the plane is taxing’ in the airport lounge. My personal favourite is the Malaysia Airlines Golden Lounge in Kuala Lumpur International Airport, followed by its sister in Heathrow Terminal 4 (below). 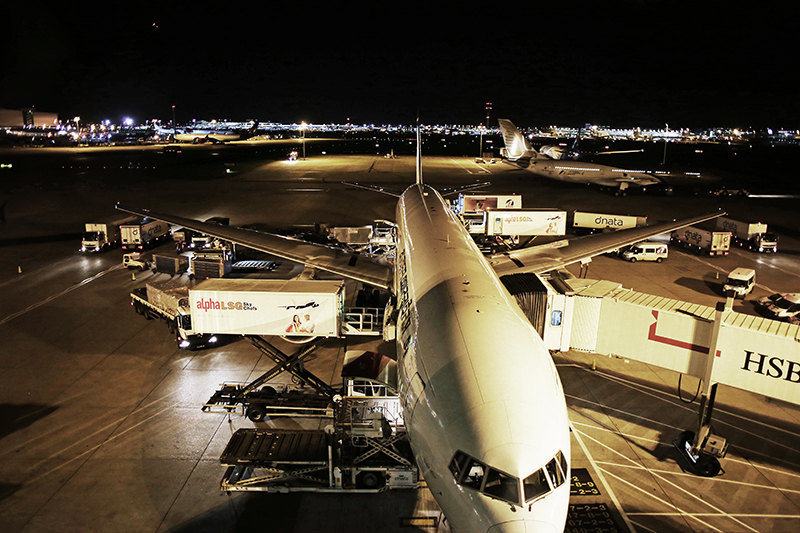 A glass of scotch, a cocktail or two with a plate of cheese served by a chipper lady who’s a dead ringer for Mrs. Potts, followed by a shower before boarding the plane…this is what the aviation experience is all about. Malaysia Airlines First Class Golden Lounge at Heathrow, Terminal 4 - where holidays (and hangovers) start. I forgot to mention - I love watching planes depart and arrive while waiting to board my own flight. There’s something just so awe-inspiring about man breaking his earthly bounds in a steel bird to tickle the beard of God. Andrea Sachs’ idea of bliss is her boss on a flight because it’s the one instance the Prada-wearing she-Devil can’t harass her with Sisyphean demands. While I can count on half a hand the number of bosses I’ve had (oh, the joys of working for yourself…) I can definitely relate. These days everyone is far too connected for their own good and smartphones are making us stupid (or rather, distracted), so the pleasure of being uncontactable and unaccountable for a good few hours is definitely a 21st- century privilege. So what do I do when I’m in the zone? It can go either way: extreme relaxation or dedicated productivity. Or even both, why not when I have a baker’s dozen-phone call-free hours to spare? Whether I’m banging out a blog post on my Macbook Air (air! In the air! If only I could upload to cloud, hur hur) or binge-watching Modern Family to endless glasses of champagne, it’s clear that my pod is a space that is very much my own, only to be invaded by the occasional friendly flight attendant offering to top up my glass. Pushing pixels. Admiring the all-grey coordination of the in-flight beauty kit with my handbag and cabin bag. Snuggling up with my seat mate over drinks. Brushing up on my geography with the live flight route maps and playing pop quizzes with my boy. I don’t care much for fashionable cynicism no matter how many bearded hipsters insist that it’s terribly gauche to express interest about anything that isn’t an avant-garde health hazard that should come with a tetanus jab. 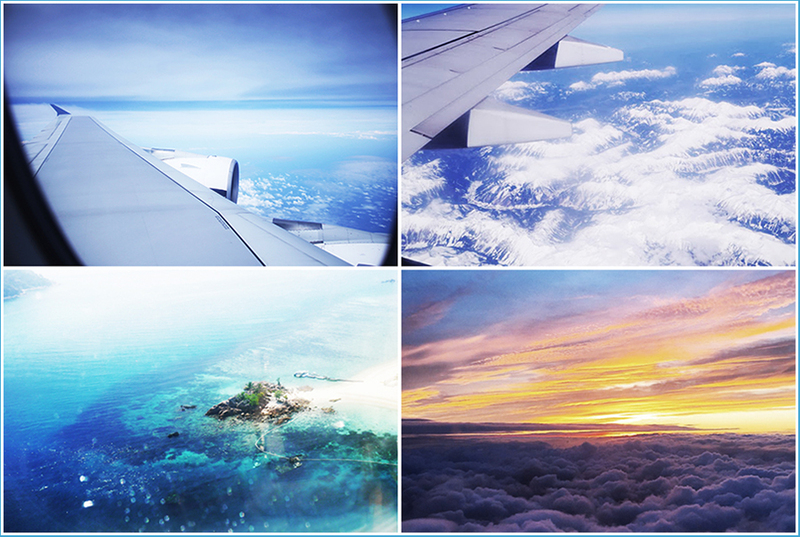 Fact is: soaring through the skies and over clouds is exciting. C’mon, you’re defying gravity and flipping the figurative bird to Mother Nature. I take over twenty flights a year but the sight of fluffy little rice balls bobbing past my window never does and never will get old. Now take that magical scene and extend it to a baker’s dozen-hour long movie marathon and tell me, isn’t or is this the Greatest Show over Earth? Views from: 1) My recent flight from London to Kuala Lumpur, b) my flight from Istanbul over the Alps, c) over Redang Island, and d) the pastel-hued skies over an English sunset. Counted your blessings yet? Let’s start by thinking about what we love, not what we dislike, and let’s make the best out of a mildly-inconvenient situation to one with unique opportunites. 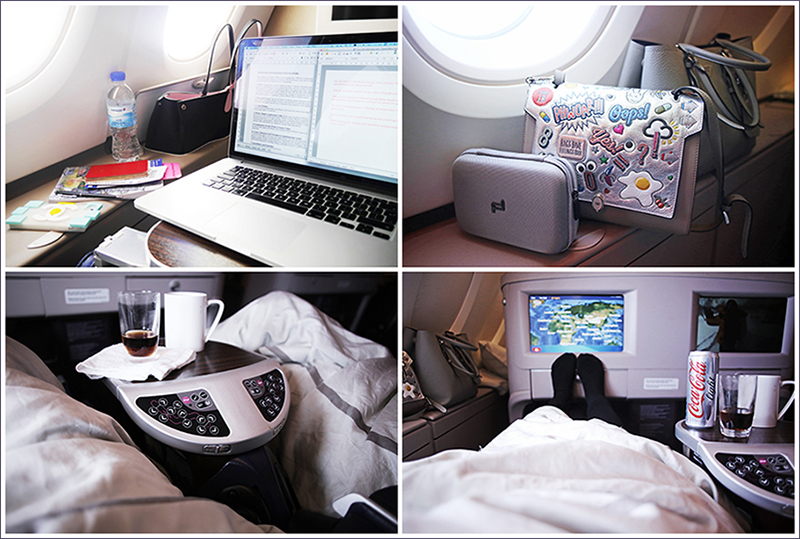 This ode to my love of long haul flights is my contribution to the February Travel Blogger Link up. Read more wonderful love letters to the things, people, and experiences they love, here!